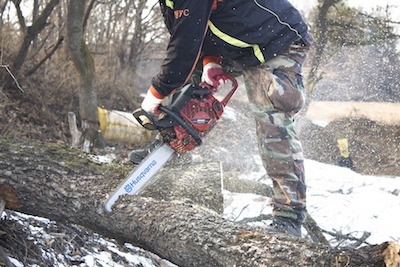 Does your line of work have you operating a chainsaw on a daily basis? Are you an enthusiastic DIY-er that often handles chainsaws? Then you need the best chainsaw boots on the market. Unfortunately, there is no such thing; there are just the best chainsaw boots for you. We’re here to help with a complete buying guide, explaining the current legislation and the standard ratings for chainsaw boots. We’re also discussing other important factors that influence your choice, analysing them according to your purpose and the environment you’re working in. If you’re in a rush, scroll down to go straight to the chainsaw boots reviews. Chainsaws are some really powerful machines, and we all know what can happen if they go haywire, so your work boots need to respect the legislation. The current standard is the EN ISO 20345:2011, which means these boots can resist an impact of 200 J, which equals a weight of 20 kg that’s been dropped from a distance of 1020 mm. There’s also the compression test, which means these boots can resist a force of 15 KN. That’s equal to 15 tons being placed on the toe of your boots without injuring your feet. SB:Your boots meet the minimum safety requirements and have an oil-resistant sole. SBP:These boots are resistant to penetration of at least 1100 N.
S1:These boots resist static electricity and have an energy-absorbing heel. S2:The uppers of these boots are water-resistant. S3:The outsoles of these boots can resist both water and penetration. S4:Such boots have a rubber or polymer construction, they’re waterproof, anti-static, and their heels absorb energy. S5:These boots meet the same characteristics as the S4 boots, but they’re also resistant to penetration and boast cleated outsoles. There are three classes of chainsaw boots that go along with the safety standard. Each class shows you how resistant your boots are against various chainsaw speeds, meaning at which speed the chainsaw can be stopped or not. Chainsaw boots class 1 can resist a chainsaw speed of 20 m/s. Chainsaw boots class 2 are a bit more resistant, being tested to speeds up to 24 m/s. And lastly, chainsaw boots class 3 can stop chainsaws running at a maximum speed of 28 m/s, making them the most resistant. This is definitely on top of your list when you’re choosing a reliable pair of chainsaw boots. Steel toe caps are the best in terms of protection, but they’re also the heaviest and the least comfortable. Alloy toes are lighter, and similarly protective, though they can’t handle compressions as well as steel toes. You can choose a pair of composite toe boots if you’re looking for lighter footwear, but these are the least protective against impacts and compression. However, they’re great for environments with a lot of electrical hazards and static electricity. Apart from chainsaw hazard protection, the best chainsaw boots on the market offer you great protection against all types of hazards and weather. But you should look for specific types of protection that fit your line of work. For instance, if you’re working in a cold, wet environment, you need waterproof and insulating boots, but if you’re working in hot climates, insulation isn’t that necessary. If you’re working in a place where there’s a lot of danger for slips, you should look for a reliable sole, especially one that’s made from rubber. And don’t forget about how supportive you want your boots to be. If you’re constantly on your feet, if you’re climbing or walking a lot, you need increased ankle support, so look for a sturdy shank and a higher shaft. Who says work boots can’t be comfortable? You need to get a pair of boots that offer you protection and increased durability, but not at the cost of comfort. So make sure you don’t get a pair that’s too heavy, particularly if you’re always on your feet. Apart from that, we’d advise you to choose a pair of boots with anatomical design, particularly if you’re working long shifts on rugged terrain. An ergonomic construction reduces foot fatigue, and also prevents aches and pains in other parts of your body, like your back. Of course, the fit is paramount to achieving the desired level of comfort, but it’s quite iffy if you’re buying your work boots online. So make sure you read about the fit as expected rating, and choose your pair of boots after you browse some user reviews. Still, take into account the official table chart too. Your fit will still vary according to weather, as well as the type of toe caps your boots have. Steel toe caps have a narrow toe box, though some work boot models provide a specific design that minimizes this flaw. When you’re choosing your boots, make sure that you feel comfortable around your heel, toes, and ankles. Since these are reinforced or padded, a poor fit might cause blisters and lots of pain. With that in mind, let’s see what the market can offer us. We’ve selected products from different classes, with various materials used for their construction and with, therefore, different capabilities. Plus, we’ve summarised both their strong and weak points, so you can choose what’s best for you. The Haix Protector Pro are some of the most expensive chainsaw boots of these reviews, but definitely some of the best chainsaw safety boots. That’s because they’re very protective and versatile and can be used in different environments and different weather, from hot to cold. The first thing that makes them so well-rated is their steel toe caps, doubled by rubber toe caps. So they’re not solely protective against impacts, compression, and class 1 cuts; they’re also extremely comfortable and reliable. And their steel midsole comes as a great addition in terms of its resistance to punctures. 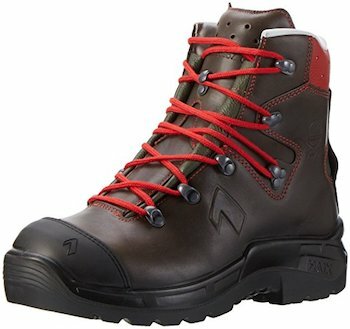 I like the leather upper, it’s very resistant to impacts and punctures, but it’s also waterproof and fairly breathable, which is really an asset if you’re looking for a pair of boots you can use in different climates. The 2.3 cm heel is supportive too, and it will provide you a great cushioning. Don’t forget the Gore-Tex lining that really rounds up the portrait of these boots, with its breathable, moisture-wicking design for moist and warm climates. But the fleece midlayer is what will help you work in the colder environments, keeping your feet warm and insulated. Besides all that, I like how comfortable these boots are. The toe caps are anatomical, and in fact, their whole design is ergonomic. Their rubber and polyurethane soles can absorb shocks, but they’re also anti-slip, flexible and resistant to wear and tear. The thing I love most about these soles, though, is that they have a beveled contact surface. In fact, I had a hard time deciding if I like the increased contact surface more than the micro-softlight system, seeing as this offers increased insulation, as well as a great resistance to oil and gasoline. And if we’re talking about grade A insulation, the HAIX Climate System comes with sun-reflection technology too, so basically powerful and direct sunlight is repelled by the leather uppers, so your feet don’t heat up. The Oregon Yukon boots are among the best-rated chainsaw boots you can find. One of the reasons could be they’re affordable, but that’s definitely not the only factor. When you’re analysing their build, you can only notice quality in the materials used, craftsmanship and design. Let’s start with the uppers. These are made from leather, which is resistant to water and punctures. The truth is that these boots are not entirely waterproof, so you can’t soak them in water puddles right from the box, but you can apply a waterproofing spray if that’s your purpose. However, I like the PU construction, that’s very resistant to impacts, as well as the polyester protection, which works like a charm against scratches. Besides, the waterproof lining won’t let your feet sweat because it’s moisture-wicking and breathable. Their steel toe caps protect your toes against impacts, compression and chainsaw cuts, though they’re a bit tight at first. Even the outsoles help you tackle some of the toughest work conditions you can think of considering they’re resistant to hydrocarbon, prevent perforations and don’t let you slip. And if you’re worried about the lacing system, you should know that the Oregon Yukon boots come equipped with 170 cm worth of laces, and non-corrosive metal holes, that add to the overall protection of these boots. And to top it all off, the 65 kg pulling resistance and the KWF certification really attest these are some of the best chainsaw safety boots on the market. In the world of the best budget chainsaw boots, the Skellerup Euro Forester boots are equipped with some wonderful features, and they’re also a Class 3 product so they can resist cuts at 28 m/s. The first thing you notice about these boots is their affordable price. The Oregon Yukon boots are among the best value chainsaw boots, however, they’re not waterproof. On the other hand, the Euro Forester boots are completely waterproof, which comes courtesy of their rubber construction. Still, that’s also what makes them heavier than their Oregon Yukon counterparts. I like their Suregrip 360 nitrile outsoles too, which are perfectly fitted to resist all sorts of slips. 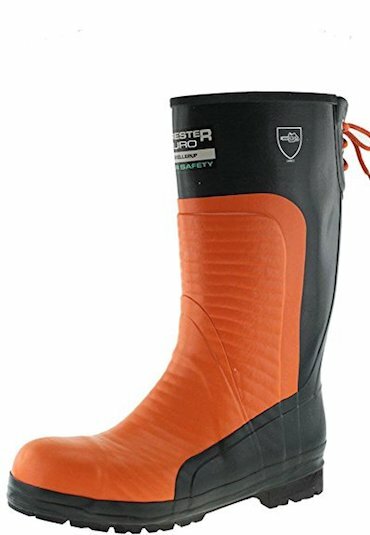 Basically, with their waterproof, anti-slip and knee-high design, along with 0.5-centimetre high heels, these boots are perfect for working in damp, cold environments. 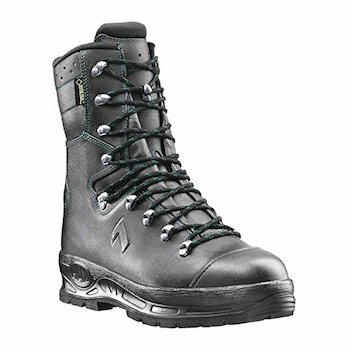 The lace-up closure is also very secure, and I like their steel toe cap that’s resistant to impacts, cuts, and compressions. Still, the best feature of these boots is their midsole, that’s made of steel and resistant to punctures. These are quite comfortable, because of the toe caps that boast the comfy ComfortFoam, although they require some extensive breaking in. The ballistic shin guards contribute to that prolonged breaking in period, but you should know they’re really quite supportive and protective. If you’re working in a wet environment, filled with puddles, and exposed to pretty high temperatures, the Haix Protector Light Light boots are the best waterproof chainsaw boots you can find. Although they cost more than the other boots reviewed here, all that money goes into the promise of a great quality. But let’s start with their main promise, which is visible right from the name: these are some really light boots, so light they had to say it twice. One of the reasons is that they’re manufactured from Nubuck leather, which has other attributes too, like the fact that it repels water and that it’s also breathable. Besides, the class 1 protection against cuts is pretty good to guard you against 20 m/s cuts. I also like the 2.2 – 2.4 mm inner lining, that’s thick enough to provide good insulation, but it’s also breathable and a great asset in warm environments. Besides, the non-woven insole is moisture-wicking, as well as anatomically-shaped to keep your feet dry and comfortable. If you don’t like these insoles though, you can easily take them off altogether, or replace them with others. The toe caps are anatomically shaped too, which I like in terms of comfort. However, they’re made from TPU, so they’re not as resistant to impacts and compression as steel toe caps, though they can protect you well enough against falling branches. And I can’t help but notice the trademarked KEVLAR® through-sole, that’s flexible, supportive and protective. The rubber sole boasts a very durable street tread and can easily bend and absorb shocks. These soles are very resistant to wear and tear, but they’re also perfect against all slips, in all types of weather. The PU wedge is something else I like considering it absorbs shocks, and don’t forget that the sole works like a charm to keep your feet safe from heat, oil, and gasoline. With an integrated heel bend that’s really great to prevent foot fatigue, these Haix Light Light boots are also really durable. They don’t have side seams, so they’re durable and supportive. The best news yet? These boots can also be used in an environment with static electricity, thanks to their anti-static properties. We’ve taken you through a series of the best-rated chainsaw boots on the market, so we hope you found something you like. Some of these boots can be used in cold weather, some are great for warmer weather, but they’re all tough and reliable. What about you? Have you ever owned a pair of these boots? What would you make of them? Any other particular pair you’d want us to add to this list?